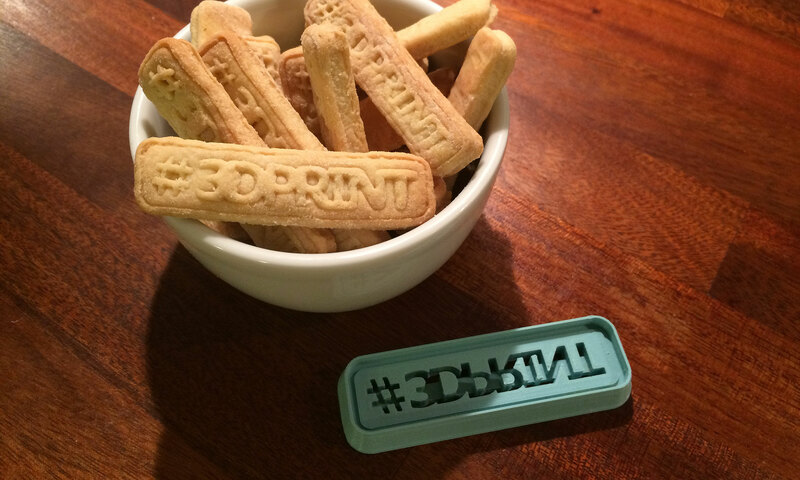 #3dprint Cookie Cutter. Check out design instructions for the recipe! Using an electric hand mixer, beat butter, sugar and vanilla until pale and creamy. Add egg. Beat until well combined. Sift flour and cornflour over butter mixture. Mix well. Divide in half. Press each half into a disc. Wrap each disc in baking paper. Refrigerate for 20 minutes. Preheat oven to 160°C. Line 2 baking trays with baking paper. Roll each disc out between 2 sheets of baking paper to 3mm-thick. Using letter-shaped biscuit cutters, cut letters out of dough. Place onto trays. Roll leftover dough together and repeat. Refrigerate biscuits until firm. Bake for 15 minutes or until light golden. Stand on trays for 5 minutes. Transfer to a wire rack to cool. The print was pretty good, used 0.1 mm layer height and 50% infill and the result seems pretty sturdy. I didn't have all the ingredients for the cookies, so I had to use some improvisation, but they turned out decent, tastes ok, but could have used a bit more vanilla. I would say that it's better to roll out the dough a little too thick rather than too thin, to get a good impression in the dough.